After the successful conclusion of the American Revolutionary War, many state governments turned to public art to commemorate the occasion. Given his critical role in both Virginia and the colonial cause, it is unsurprising that the Virginia General Assembly desired a statue of George Washington for display in a public space. And so, in 1784, the Governor of Virginia asked Thomas Jefferson (another Virginian who was then in Paris as the American Minister to France) to select an appropriate artist to sculpt Washington. Seeking a European sculptor—and for Jefferson, whose Francophile sympathies were clear, preferably one who was French—was a logical decision given the lack of artistic talent then available in the United States. Through basic necessity, this portrait of an American hero needed to be made by a foreigner. Jefferson knew just the artist for this task: Jean-Antoine Houdon. Trained at the Académie Royale de Peinture et de Sculpture and winner of the prestigious Prix de Rome in 1761 when only twenty years of age, Houdon was, by the middle of the 1780s, the most famous and accomplished Neoclassical sculptor in France. 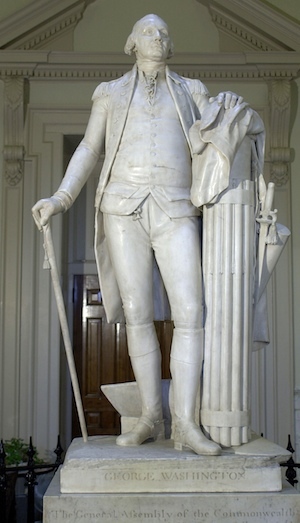 Jefferson commissioned Houdon to complete a monumental statue of Washington. Given Houdon’s skill and ambition, the sculptor likely hoped to cast a larger-than-life-sized bronze statue of General Washington on horseback, a format appropriate for a victorious field commander. However, the final product, delivered more than a decade later, was a comparatively simple standing marble. Evidence suggests that Houdon was supposed to remain in Paris and sculpt Washington from a drawing by Charles Willson Peale. Uncomfortable with carving in three dimensions what Peale had rendered in only two, Houdon made plans to visit Washington in person. Houdon departed for the United States in July 1785 and was joined by Benjamin Franklin—who he had sculpted in 1778—and two assistants. The group sailed into Philadelphia about seven weeks later and Houdon and his assistants arrived at Mount Vernon (Washington’s home in Virginia) by early October. There they took detailed measurements of Washington’s body and sculpted a life mask of the future president’s face. While in Virginia, Houdon created a slightly idealized and classicized bust portrait of the future first president. But Washington disliked this classicized aesthetic and insisted on being shown wearing contemporary attire rather than the garments of a hero from ancient Greece or Rome. With clear instructions from the sitter to be depicted in contemporary dress, Houdon returned to Paris in December 1785 and set to work on a standing full-length statue carved from Carrara marble. Although Houdon dated the statue 1788, he did not finish it until about four years later. The statue was delivered to the State of Virginia in May of 1796, when the Rotunda of the Virginia State Capitol was finally completed. In time, this statue of George Washington has become one of the most recognized and copied of images of the first president of the United States. Houdon did not just perfectly capture Washington’s likeness (John Marshal, the second Chief Justice of the Supreme Court later wrote, “Nothing in bronze or stone could be a more perfect image than this statue of the living Washington”). Houdon also captured the essential duality of Washington: the private citizen and the public solider. Washington stands and looks slightly to his left; his facial expression could best be described as fatherly. He wears not a toga or other classically inspired garment, but his military uniform. His stance mimics that of the contrapposto seen in Polykleitos’s classical sculpture of Doryphoros. Washington’s left leg is slightly bent and positioned half a stride forward, while his right leg is weight bearing. His right arm hangs by his side and rests atop a gentleman’s walking stick. His left arm—bent at the elbow—rests atop a fasces: a bundle of thirteen rods that symbolize not only the power of a ruler but also the strength found through unity. This visually represents the concept of E Pluribus Unum—”Out of Many, One”—a congressionally approved motto of the United States from 1782 until 1956. Washington’s officer’s sword, a symbol of military might and authority, benignly hangs on the outside of the fasces, just beyond his immediate grasp. This surrendering of military power is further reinforced by the presence of the plow behind him. This refers to the story of Cincinnatus, a Roman dictator who resigned his absolute power when his leadership was no longer needed so that he could return to his farm. Like this Roman, Washington resigned his power and returned to his farm to live a peaceful, civilian life. 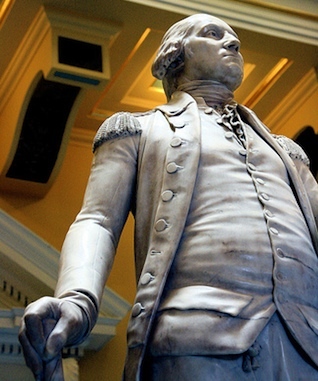 The statue, still on view in the Rotunda of the Virginia State Capitol, is a near perfect representation of the first president of the United States of America. In it, Houdon captured not only what George Washington looked like, but more importantly, who Washington was, both as a soldier and as a private citizen. The enormously talented Houdon wisely accepted Washington’s advice. Indeed, Washington knew it was better to be subtly compared to Cincinnatus than to be overtly linked to Caesar, another Roman who, unlike Cincinnatus, did not surrender his power. To compare Houdon’s statue to Horatio Greenough’s 1840 statue of Washington only makes this salient point more clear. With the sitter’s urging, Houdon opted for subtlety, whereas Greenough decided two generations later to fully embrace a neoclassical aesthetic. 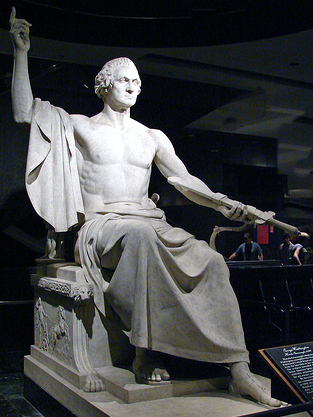 As a result, Houdon’s statue celebrates Washington the man, whereas Greenough deified Washington as a god. Cite this page as: Dr. Bryan Zygmont, "Jean-Antoine Houdon, George Washington," in Smarthistory, August 9, 2015, accessed April 22, 2019, https://smarthistory.org/houdon-george-washington/.